"Is that the kid that’s been bothering you?" I asked my youngest daughter. "Yes" she replied as she climbed into the car. This boy had been bugging her for months, and no matter what she said, he wouldn’t relent. I had told her time and time again that she needed to stand up for herself, and tell him to leave her alone. He didn’t seem to care much about what she said, so I decided it was about time for him to catch a glimpse of Momma Bear. Maybe my strong, direct approach would coax him to change his ways and stay away from my daughter. You know, it doesn’t take much for us Moms to get all riled up to the point where the claws come out, and I had my radar set on this kid. I threw my car into park, and stepped outside, so caught up in the moment that I left my car door open. I ran through my mind what I would say to him to make sure he got the message. Something like “Hey kid, stay away from my daughter or I’ll sick my dog on you”. Of course, I’m kidding, but you know you’ve thought something similar in those moments of Momma madness. (C’mon now, don’t lie) My eyes were locked on him as I walked with intention over to where he was standing. I rounded the back of my car, and gently placed my hand on the trunk. Something was not right. Something was very wrong. ”Mom…mom…mom…” I heard my daughter’s voice coming from the car. To my horror, my car was indeed not in park, it was in drive, and it was…ahem….driving. I darted back to the driver’s seat that was a good 5 feet farther down the road than it had been when I’d left it, jumped in to the front seat, and slammed on the brakes. Yep, that happened. In front of about 20 kids, a jaw dropped, SUV driving mom, and a bewildered crossing guard, I had just avoided a near catastrophe. (No children were harmed in the making of this story). You’d better believe I still went and gave this boy a talking to (albeit a little more humble than I had been initially). However, I’m pretty sure my cat-like speed and ninja reflexes terrified him enough to the point where my words weren’t necessary. MmmHmm, that’s right kiddo, this Mom ain’t kidding around. Ok, hang on, I have a point here I promise. 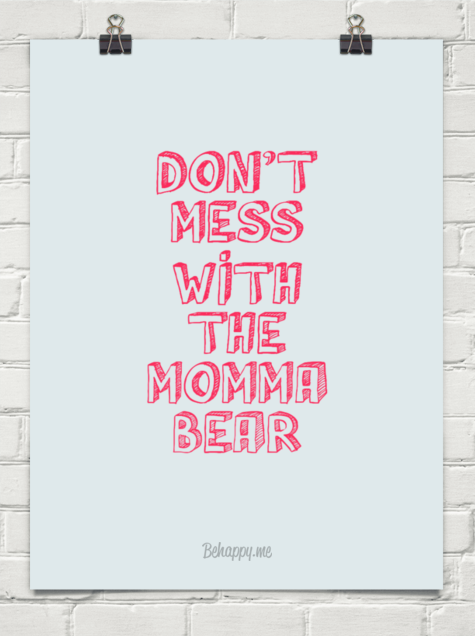 The Mama Bear in me reminds me of the protector I have in Jesus. He has met me in my deepest, darkest places. He has been with me where no one else was welcomed or would dare to go even if they were invited. He has never abandoned me, and He promises He never will. What a comfort it is to know that I have Almighty God fighting for me. To know that my battles aren’t really mine after all. Exodus 14:14 says The Lord will fight for you, all you will need to do is stand still. While He may not confront our bullies and give them a swift talking to, that is beside the point. God is standing with me, walking beside me, and carrying me when I can no longer bear my own weight. What a beautiful comforter and protector He is. p.s. if you like the print above, you can get it right here.